In a large bowl, stir 1 cup of the flour, the rosemary, sugar, salt and yeast with a wooden spoon until well mixed. In a 1-quart saucepan, heat the water over medium heat until very warm and an instant-read thermometer reads 120°F to 130°F. Add the water and 3 tablespoons oil to the flour mixture. Beat with an electric mixer on medium speed 3 minutes, stopping frequently to scrape batter from side and bottom of bowl with a rubber spatula. With a wooden spoon, stir in enough of the remaining flour, 1/4 cup at a time, until dough is soft, leaves side of bowl and is easy to handle (the dough maybe slightly sticky). Sprinkle flour lightly on a countertop or large cutting board. Place dough on floured surface. Knead by folding dough toward you, then with the heels of your hands, pushing dough away from you with a short rocking motion. Move dough a quarter turn and repeat. Continue kneading 5 to 8 minutes, sprinkling surface with more flour if dough starts to stick, until dough is smooth and springy. Spray a large bowl with the cooking spray. Place dough in bowl, turning dough to grease all sides. Cover bowl loosely with plastic wrap; let rise in a warm place 30 minutes or until dough has almost doubled in size. Dough is ready if an indentation remains when you press your fingertips about 1/2 inch into the dough. Spray 2 cookie sheets or 12-inch pizza pans with the cooking spray. Gently push your fist into the dough to deflate it. Divide dough in half. Shape each half into a flattened 10-inch round on a cookie sheet. Lightly spray 2 sheets of plastic wrap with cooking spray; cover the dough loosely with the plastic wrap, sprayed side down. Let rise in a warm place about 30 minutes or until dough has doubled in size. Remove plastic wrap. Heat the oven to 400°F. Using your fingers, gently make 1/2-inch-deep depressions about 2 inches apart in dough. Carefully brush with 2 tablespoons oil, using a pastry brush; sprinkle with cheese. Bake 15 to 20 minutes or until golden brown. Serve warm or cooled. Serve slices with a bit of olive oil and shredded Parmesan cheese for dipping. Gently make 1/2-inch-deep depressions about 2 inches apart in dough, using fingers. 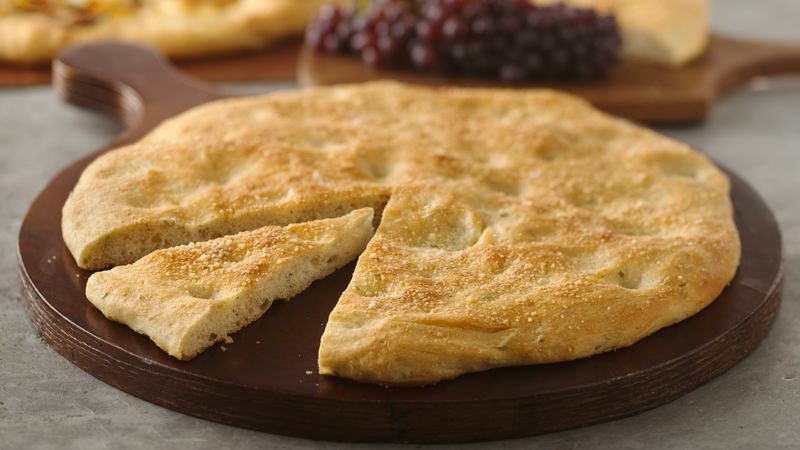 If dough is sticky, dip your fingers in flour.